There are no programs or organizations in place in Arizona for chinchillas needing homes or for those caught in the middle of an emergency situation. 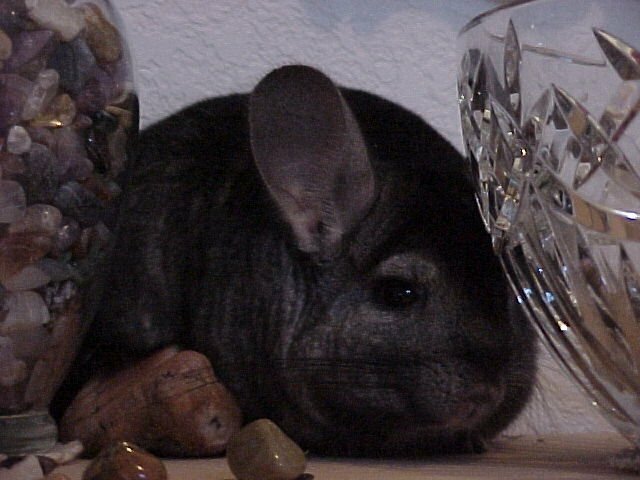 So I think that it is absolutely necessary for the chinchilla breeders and owners of Arizona to have a sort of network to help each other out when needed. Taking a chinchilla to an animal shelter can end up in a dead or sick chinchilla because of issues with diet and temperature sensitivity. 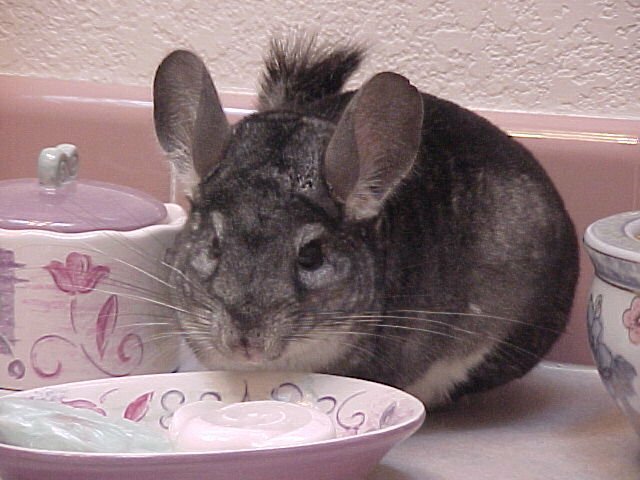 Ideally, there should be a place to take a chinchilla if a person can no longer care for his or her pet. Also it is possible to help provide an alternative to pelting chins for use in garments. 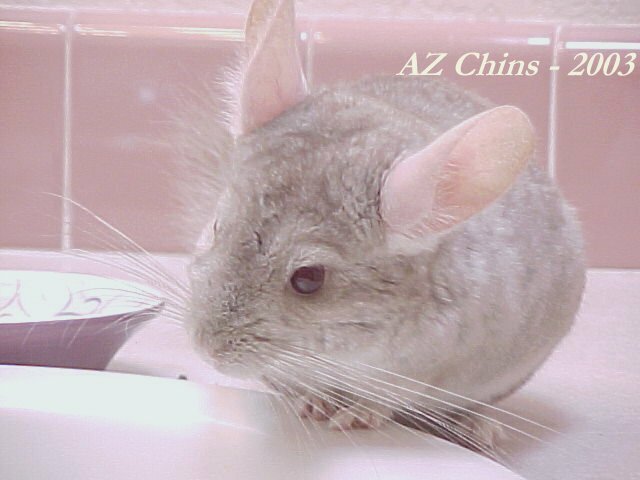 AZ Chins has participated in several rescue efforts by buying chinchillas that are from ranchers' pelting runs. I have made this website as a resource for chin breeders and owners, as well as a way to find homes for homeless, pet rescue, ranch rescue or other unwanted chinnies. It would be wonderful if we could work on issues with proper chinchilla care and the boarding of animals. PLEASE let me know if you would like to help out!! I will put your name, email and phone number (if you would allow this) in the directory for people to call when they need some help with their chins. Just to clarify, pet rescues and ranch rescues (Ranchies) are completely different things. Both are rescued from bad situations, pet types may be abused and neglected and Ranchies will ultimately be pelted if nothing is done. Many times pet rescues have been neglected and require extensive care to nurse them back to health. Ranchies are, almost always, extremely healthy. However, Ranchies may need extensive work to get them to be good pets, it can sometimes take several weeks to gain their trust. We make an effort to work with both pet owners and ranchers to find homes for chinchillas and give them a second chance at a happy, healthy, long life as pet chinchillas. Everything is done in the very best interest of the chins and they are only adopted to appropriate homes. All animals that come here are named and cared for as pets! Any of the rescuers on our list are expected to do the same. Each chinchilla is precious and deserves to be treated with love and respect. Rescue is not meant to judge anyone for any reason. The chinchillas are what is important. All differences between us humans MUST be put aside for the good of the animals in our rescue efforts. Taking in and adopting rescues is such a small thing that any of us can do to help chins that mean so much to us. Welcome to this page and our website. Please feel free to use anything on AZChins.com or any other content of the site as a resource. If you would like to contribute an article or a point of view, please let me know. THANK YOU!! I do my best to update things on the website, but things tend to get very busy around here with the chinchillas and everything that needs to be done to keep the chinchillas healthy and happy. I seem to always have rescues available for good homes even if the website does not reflect that. Right now there are several chins that need homes. Many are older chins that will make wonderful pets but very few people want them because of their ages or because they are in pairs. I do have some pairs of younger rescue chins, please let me know if you are interested. The adoption fee for all rescues is $45.00. Right now I have mostly standard greys, but there are some beiges and ebonies, as well. Please email me at rescues@azchins.com for more information about them. When you email please tell me what you are looking for, your name and if you have had chinchillas as pets in the past. If you have questions about AZ Chins Rescue, please email me at rescues@azchins.com. You may also contact me at 520-490-7873 should you have an emergency or need to surrender a pet. Thank you so much for visiting our rescue site. You are the reason why this page is up.